Around the last corner of his show at A Foundation, you stumble upon this workshop of nature-loving Antti Laitinen. The scene is not filled with charm or wonder, but rather shock and horror. Something unexpected and industrial is going on. There are gas cylinders and what look to be tar bricks. Work has suddenly stopped, hence the volume of wood shavings on the floor. The boat looks crude. It would do. Its main constituent is bark from the floor of the forest in Finland where Laitinen lives. To make this vessel seaworthy is requiring some violence. A week after the show opened, the artist rowed this very boat up the River Mersey for three and a half hours. His trip combines elements of the magical and the manic. Perhaps all ecological statements need a little of either. Fairy-like, the trees shed their bark for our use. Termite-like, humans will work with whatever they can get. Other works in the show feature the artist digging a burrow into the soil and, apparently, eating ants off the end of a stick. More horror results, but you would have to call Laitinen a survivor. 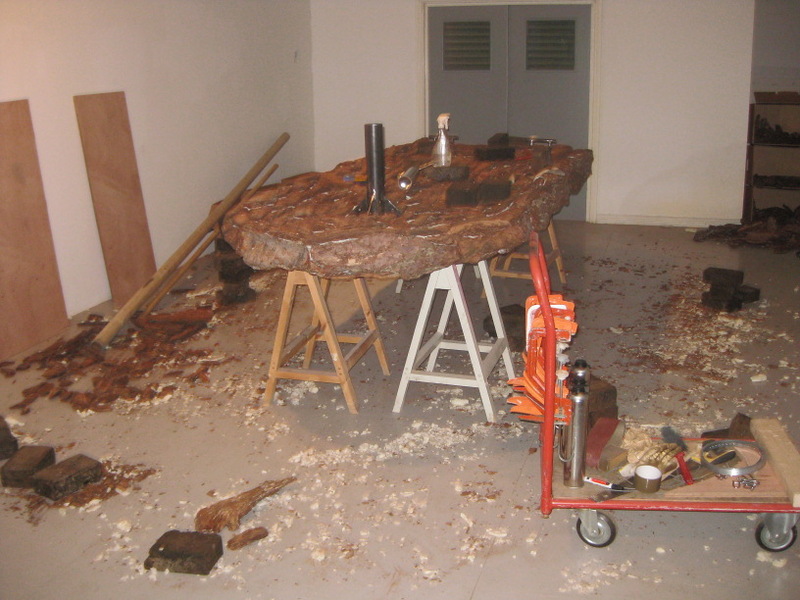 The Bark is a new commission by A Foundation and the Liverpool Biennial 2010 and can be seen in Laitinen’s show at the former until November 28 2010. You can read more about the artist on the blog Big Fat Failure or the artist’s own website. Here is also a film on YouTube about a previous 19-hour voyage he made in a bark boat.